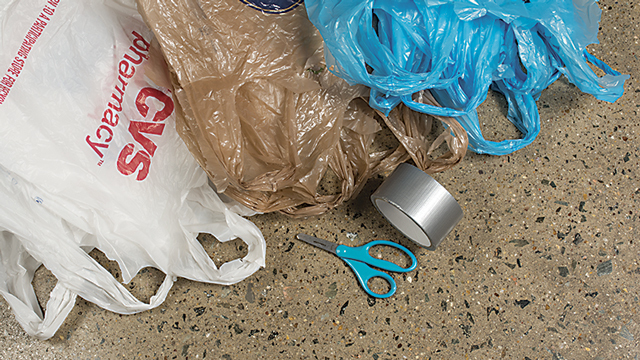 Do you have a bag full of plastic bags at home? Here’s a great way to upcycle this common item that, sadly, finds its way to our oceans all too often. Just decide on the length of your jump rope, and get busy! 2.Cut down both sides of the bag without cutting the top of the handles. You should now have one large loop of plastic bag. 4.Start with two bag loops. Thread one bag loop into a knot through the other, and pull tight. You should have a chain of two bags. 5.Add four more bags to your chain. 6.Repeat steps 4 and 5 two more times to make a total of three separate chains. (If you are making a larger jump rope add the extra bag loops to each chain). 7.Lay your bag chains on the floor and stagger the knots so they don’t lay right next to each other. 8.Tie the three chains together at the top, leaving four to six inches of plastic at the end. 9.Begin braiding. The braids do not have to be super tight. The tighter the braid, the shorter your rope will be. 10.When you’re done braiding the three chains together, tie a knot, leaving four to six inches at each end. These will be your jump rope handles. 11.Wrap tape around each end to make your handles. You can use colorful tape to decorate. Previous articleWho Can End Chronic Hunger?